Maybe you’ve noticed signs and properties like this on one of your country drives. Abandoned farmhouse ... a rather wistful, weathered sign announcing its availability. Did that seller get many phone calls? 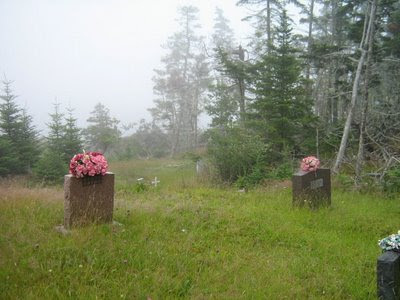 The Carnival of Genealogy 55th edition called for “Show and Tell.” Since I’m slowly working on my ancestors of Cape Breton, Nova Scotia, could I find something to SHOW that would fit the theme without disturbing the way I want to unfold the overall TELL on my blog? You betcha. The photograph is a hot sunny day at River Denys, Cape Breton in 2006. The farm for sale is the homestead of my ancestor Hector McFadyen. Seeing it was a significant moment. At the same time, it struck a pang of loss. We found ourselves wading through thigh-high grass and daisies down a long lane to Hector’s home. To my gratification and some surprise, we had been able to find the exact location. Although we were armed with the old Crown grants map and the current road map, we might not have found it without the friendly assistance of some local McLeans who grew up in a house across the road! Road map notwithstanding, the River Denys area is riddled with winding roads, mysterious to us “from away” who re-traced a few of them more than once! To our dismay everything had been abandoned for many years and the house, typical Nova Scotia frame construction, was in dire need of repair. Was this Hector’s original home, possibly built in the 1830s or 1840s? I’m no expert on historical architecture but we could see the outside entrance to the old root cellar beneath the kitchen. At a drive-by glance you wouldn’t know the River Denys is its southern property boundary. I’m told it was a bit unusual in those days to set a farmhouse so far back from the road. I hope Hector had some cattle and sheep. To date, very little information has surfaced about my ancestor Hector. My previous McFadyen blog (Part 2, 21 August 2008) gave an introduction to this transplanted Highland family. Briefly, the passenger list for the ship on which Hector’s family emigrated said he was age 19 in 1828. In Cape Breton, he married Jessie MacKenzie before 1837 which is merely the approximate year of birth for their oldest known child. His date of death and place of burial are unknown, although Jessie was a widow in the 1871 census. Census and vital records for Nova Scotia are intermittent, at best, for most of the nineteenth century—a long story made short. I know from correspondents with firsthand knowledge that the farm remained in descendants’ hands until the mid-twentieth century. River Denys is a hamlet in the sense that there is no obvious central gathering place now, such as a community centre or general store. Homes and farms are strung along the river from its source on River Denys Mountain to River Denys basin where it enters Bras d’Or Lakes. What is now Forbes United Church is on the site of the Presbyterian congregation’s first building where Hector and his father subscribed to provide a stipend in 1830 for the first minister. A fire destroyed the earliest records of the congregation’s vital events. The burial ground on both sides of the church site has few visible gravestones—none to see for Hector and Jessie, or any McFadyens. A neglected, almost forgotten family farm. How did this sad pass of affairs come to be? Well, there are clues in the economic and occupational history of Cape Breton, and inklings in family memorabilia and correspondence. Brenda's bank account was not up to buying property! Photographs by BDM and CBM in family collections. One of the most instrumental keys that unlocked doors to my McFadyen research was a derivative source. Sometimes serious(1) genealogists give short shrift to derivative sources when we are lecturing or teaching. In this case my source is a book, a compilation by J.L. McDougall called History of Inverness County, Nova Scotia. (2) The information compiled by McDougall comes from descendants of pioneer families. To a genealogist, family memory presents cautionary flags about factual reliability ... memory often being stories repeated through generations until they take on a life of their own, freely embellishing details or abandoning them altogether. This is not to denigrate a witness who personally observed certain events. It’s also not to denigrate the acclaimed oral tradition of highland clan genealogists and bards. Can today’s family historians discern historical accuracy and truth? Derivative sources and the information provided need a lot of examination and further research to attempt reasonable or convincing conclusions about events and relationships. • Donald was “a pensioned soldier” from the Isle of Coll, Scotland, who settled at River Denys. That’s an abundance of information, to be verified if possible and also suggesting more sources to explore. My examination had to ponder ambiguities and inconsistencies in the book’s information, compared with the incomplete searching I’ve managed thus far. For instance, one section of the book says the family came “about 1820.” A different source indicates these people were cleared and shipped in 1826. I think I’ll go with the ship’s embarkation date of 12 July 1828. (3) See what I mean about derivative sources? Not only that, the good captain of the vessel reported “former residence” of every passenger as the Isle of Rum. That may be because Rum is where they assembled to meet him and his ship; the estates of their laird Maclean of Coll included part of Rum. Corroboration of the family’s origin in Coll looks good, thanks to Scottish parish registers and British military records—Donald the soldier deserves more space at a future time. But the absence of Hector’s baptism (and that of a few other children) in Coll parish registers and the dearth of existing Cape Breton sources for the nineteenth century have stymied the good connecting links between generations. (1) Serious does not imply humourless. Please. (2) J.L. MacDougall, History of Inverness County, Nova Scotia (Truro, Nova Scotia, 1922; reprint Belleville, Ontario: Mika Publishing, 1972). (3) See blog post “Early Days With McFadyens” 12 August 2008. (4) Original ship’s list in Nova Scotia Archives and Records Management (NSARM), RG 18. This could also be sub-titled Little Known Episodes of Canadian History. On Saturday 9 August 2008 The Globe and Mail printed an interesting article from British Columbia columnist Gary Mason, “A Golden Discovery of Judaism in the North”: http://www.theglobeandmail.com/servlet/story/LAC.20080809.BCMASON09/TPStory/National/HYBritishColumbia. An overgrown, invisible Jewish cemetery was discovered (or uncovered) ten years ago on the hillside outskirts of Dawson City, Yukon Territory. The discovery of the small Bet Chaim (House of Life) cemetery was due to the research efforts of numerous people, spearheaded by “point man for the Jewish community in Yukon” Rick Karp. A grant enabled further research about the Jewish presence during the Klondike gold rush and restoration work for the cemetery, including the entrance arch. At least five men were buried there; now some biographical details and dates of death are known for them. Unfortunately the photos in the newspaper version can’t be shown here and are not available on the website. A historian from Hebrew University in Jerusalem is spending time there for his research on the Jewish role in the gold rush. Nice to hear some of the “lost” have been found. Ish? The best known ish is Antigonish on mainland Nova Scotia. It took me months of correspondence with city officials before discounting it as one of my ancestral homes. The Neil McFadyen who was executed for murder and buried on the beach there in 1848 was secretly exciting but certainly not one of my relatives. We don’t have Neils in our family ... what other reason did I need for discounting him? Folks, these were the dark ages of my personal investigation skills. Now of course it would be gratifying to find even a mild black sheep. 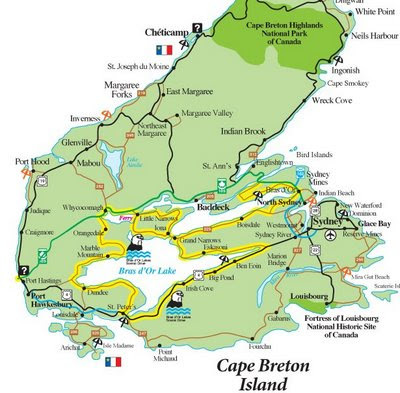 Then came the time for a family trip to the Maritimes and look, the map shows an Ingonish on Cape Breton! See? There’s Ingonish way up there on the northeast coast with a tiny umbrella. Map from Listings Canada, http://listingsca.com/Nova-Scotia/cbmap.asp. Looked good to me until we got there when local lore disavowed any McFadyens in the area. Ever. I was learning to trust that these “Capers” have long race memory, inherited from their Scottish homeland. Ish was not to be. But I’m still grateful that Auntie B tried. As it turned out later, Inverness County south of Bras d'Or Lake was the actual area. Perhaps Auntie B heard Isabella pronouncing Inverness when her false teeth were removed, as was her custom any time of day. Another fascinating Isabella habit. Later, quite a bit later, J.L. McDougall’s compiled History of Inverness County, Nova Scotia would provide me with an introduction to Donald McFadyen the soldier and open doors to his family history. Many parts of this incredible world we live in have an enthralling quality for visitors who observe others at home and at work. Something like driving through France’s Côte de Beaune when one fall morning the wine harvest suddenly springs into frenzied action. The seabound shores of Nova Scotia give a different but equally compelling view of an ages-old occupation. Small villages nestle wherever a harbour provides shelter from the pounding ocean for the fishing boats. The homes appear so tranquil they belie the struggles and dangers of fishermen bound to the sea. And so, the villages are dotted with their little cemeteries, many appearing overgrown and unkempt but still being used. The sea air contributes to the weathering of humble grave stones. Fog is almost a daily occurrence. Sometimes it dissipates early; sometimes it stays and grows like a sense-deprivation shroud. Seafaring families are a hardy, proud folk. The town of Shelburne is but one of countless that memorializes their losses to the unforgiving sea. My Cape Breton ancestors were typical of fishing families, losing fathers, husbands, brothers, in every generation. In the Annapolis Royal cemetery near Fort Anne, you can see many toppled stones. It seems no attempt has been made to uncover the numerous others that now lie beneath a layer of sod. Old grave markers carved in slate now have a protective edging. 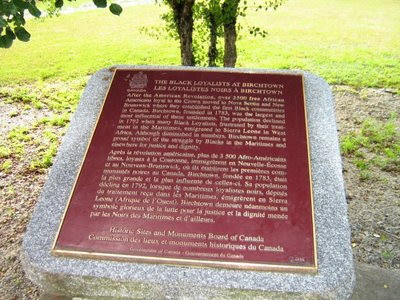 Birchtown in Shelburne harbour became the “designated” village for the considerable group of Black Loyalists who arrived with the 1783 refugees from New York City. All the markers and names in the burial ground are now unknown. Nova Scotia 2008 photographs 1, 3, 4, 5, 6 by Catherine Belle-Marie Merriman; photographs 2 and 7 by Brenda Dougall Merriman.